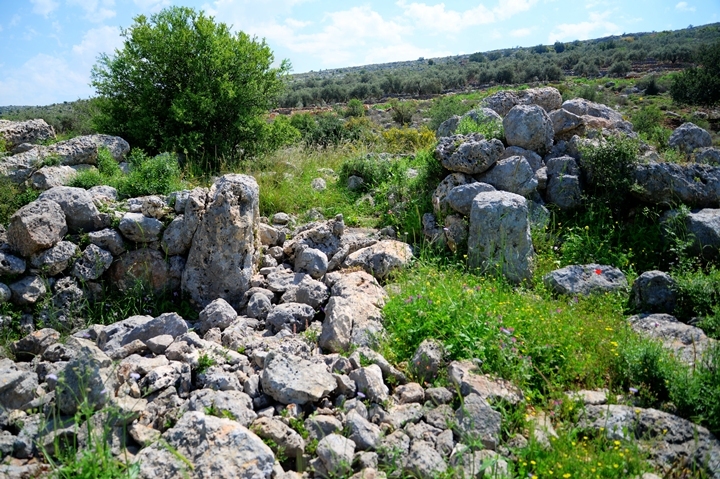 Ruins of an Iron Age fortress and village, identified as the home town of Jeroboam son of Nebat who split United Monarchy. Ruins of an Iron Age fortress and village, located on a high cliff above the valley of Nahal Shiloh. The ruin, Kh. 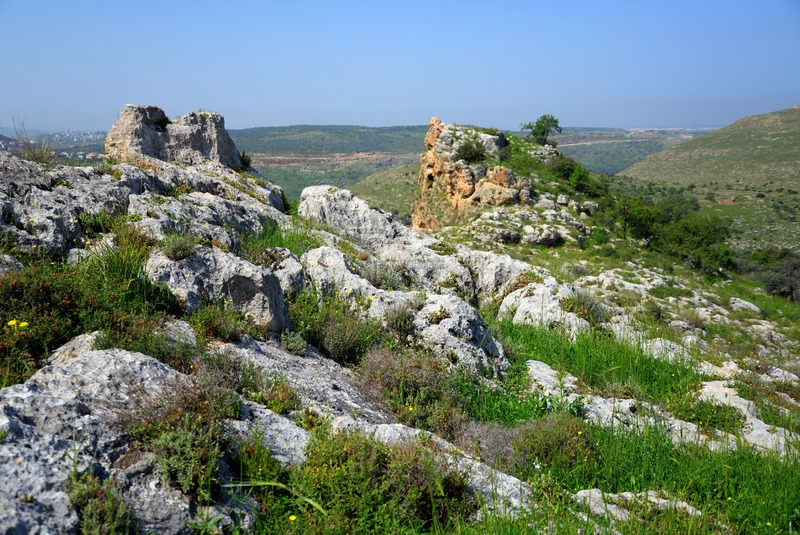 Banat Bar ("Ruin of the daughters of the son"), is identified as the home town of Jeroboam son of Nebat, the first king of the northern Kingdom of Israel after the split of the United Monarchy. An aerial map of the area around the site shows the major points of interest. The center of the Kh. Banat Bar is located on a high cliff overlooking a loop of the Nahal Shiloh stream. The Iron Age town was located on the northern and western slopes of the peak of the cliff. 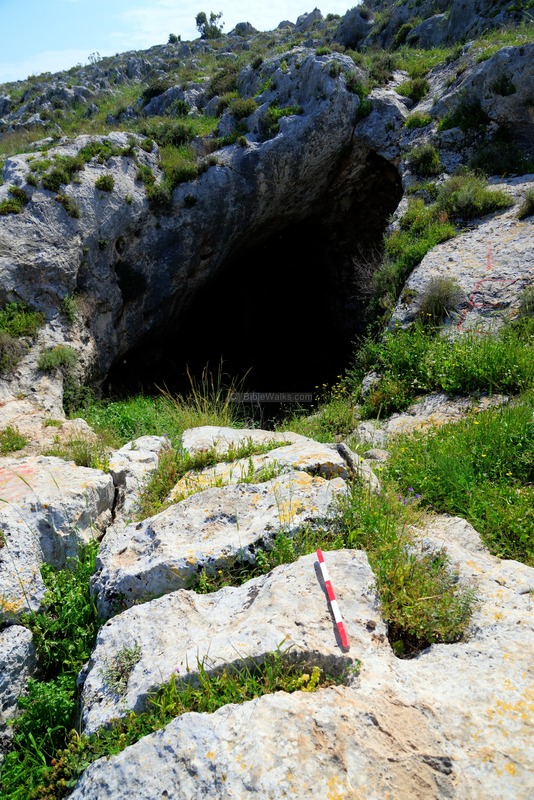 On the southern face of the cliff are caves with traces of antiquities and agriculture installations. To the south west and north west are remains of two Iron Age fortresses that overlooked the two Iron Age roads that crossed near the site. Point on the yellow squares to navigate to the selected place. "And Jeroboam the son of Nebat, an Ephrathite of Zereda, Solomon's servant, whose mother's name was Zeruah, a widow woman, even he lifted up his hand against the king. And this was the cause that he lifted up his hand against the king: Solomon built Millo, and repaired the breaches of the city of David his father. And the man Jeroboam was a mighty man of valor: and Solomon seeing the young man that he was industrious, he made him ruler over all the charge of the house of Joseph". "And it came to pass at that time when Jeroboam went out of Jerusalem, that the prophet Ahijah the Shilonite found him in the way and he had clad himself with a new garment; and they two were alone in the field: And Ahijah caught the new garment that was on him, and rent it in twelve pieces: And he said to Jeroboam, Take thee ten pieces: for thus saith the LORD, the God of Israel, Behold, I will rend the kingdom out of the hand of Solomon, and will give ten tribes to thee". Indeed, Jeroboam led the revolt of the ten tribes against the two tribes of Judah and Benjamin. In ~930 BC, on the accession of Rehoboam, David's grandson, the Unified Kingdom split to the North and South Kingdoms. (1 Kings 12: 19): "So Israel rebelled against the house of David unto this day". It is possible that Jeroboam fortified the site of his home town in preparation for the revolt. It is strategically located near major roads and has natural defenses. "And when Rehoboam was come to Jerusalem, he assembled all the house of Judah, with the tribe of Benjamin, an hundred and fourscore thousand chosen men, which were warriors, to fight against the house of Israel, to bring the kingdom again to Rehoboam the son of Solomon". 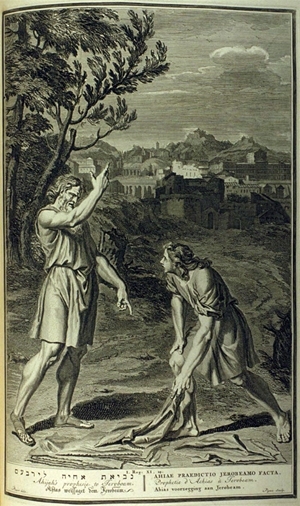 "But the word of God came unto Shemaiah the man of God, saying, Speak unto Rehoboam, the son of Solomon, king of Judah, and unto all the house of Judah and Benjamin, and to the remnant of the people, saying, Thus saith the LORD, Ye shall not go up, nor fight against your brethren the children of Israel: return every man to his house; for this thing is from me". The split of the Kingdom became a reality. Jeroboam became the first ruler of the Northern kingdom. NW to SE Route along Nahal Shiloh - This route ('S8' according to Dorsey) was used to enter the hill country, following for 10km along the valley of Nahal Shiloh. It connected Aphek (Antpatris) in the Shephela, to the hills of Samaria, via Thamnatha (Tibneh) to Gophna, and finally reached Jerusalem. 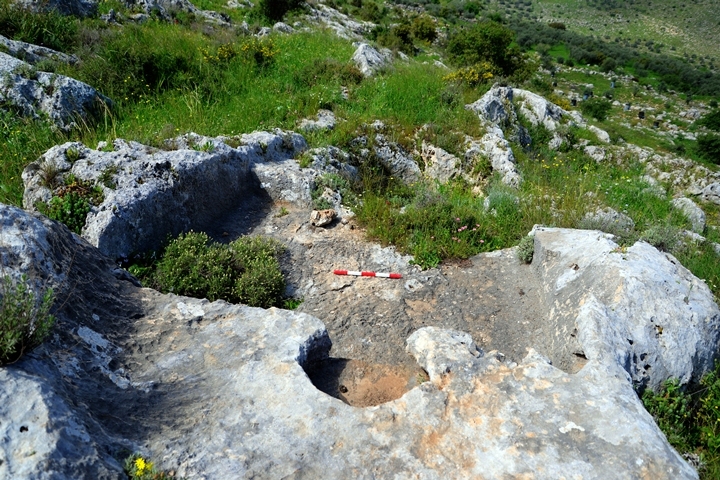 Dozens of Iron Age sites are located along it, including Zereda. A fortress south of the cliff of Zereda protected this route. SW to NE Route - This route ('S9' according to Dorsey) connected Jaffa (Joppa) and Lod (Lydda) via Rentis, thru Zereda, to Shechem. It passed along a narrow valley west and north of Zereda. 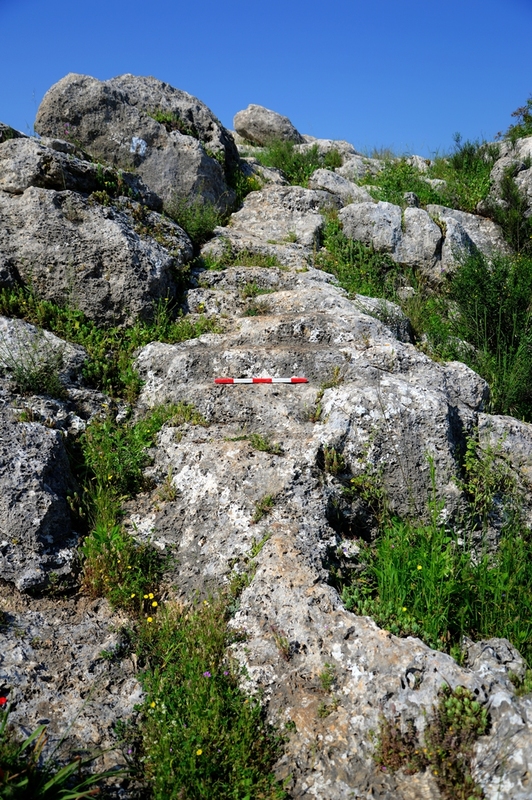 An Iron Age fortress on the north side of the site protected this route. 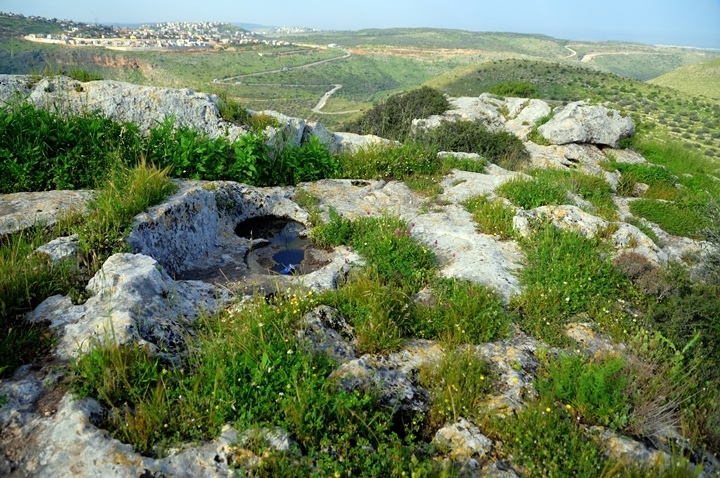 In Khirbet Banat Bar are also remains from the Hellenistic period. However, the town of Zereda relocated to another place during or after the Persian period. Its new location is not yet established. Some scholars identify it in the site below the cliffs of Iron Age Zereda, in the area of the horseshoe loop where the ruin of Khirbet Balata is located. Another location was suggested by Zev Vilnay and others (including the PEF survey) as the village of Surdah 5km north of Ramallah, based on the name of that village and the findings. Zereda is once again referred in the Mishna - the 3rd century AD written collection of Jewish Oral traditions. In the Mishna Avot (A:4) the book tells about: "Jose ben Joezer man of Zereda". Jose was a rabbi during the Hasmonean revolt (mid 2nd century BC). He served as the president of the Sanhedrin - the Jewish religious council in the second temple period. 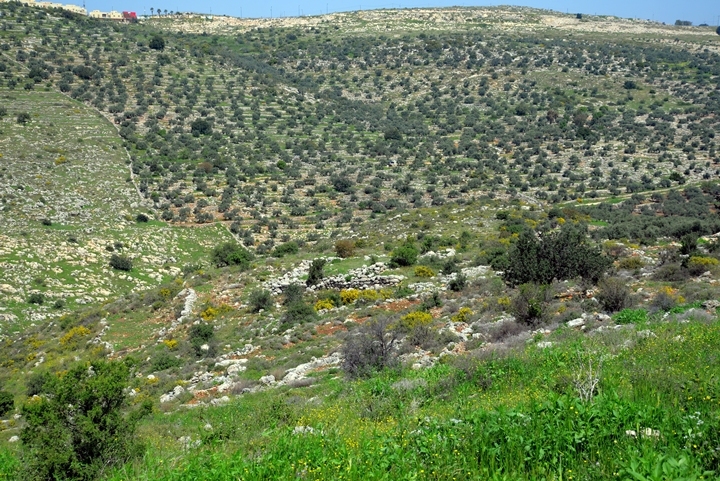 Conder and Kitchener surveyed this area during the Survey of Western Palestine (SWP) in 1873. A section of their map (of sheet 14) is shown here. The site is named on the map as "Benat Burry". Khirbet el Hamka - "Observed by Guerin immediately to the north of Benat Burry. It is described by him as a tower similar to those at Khurbet Deiria. It is not on the map". 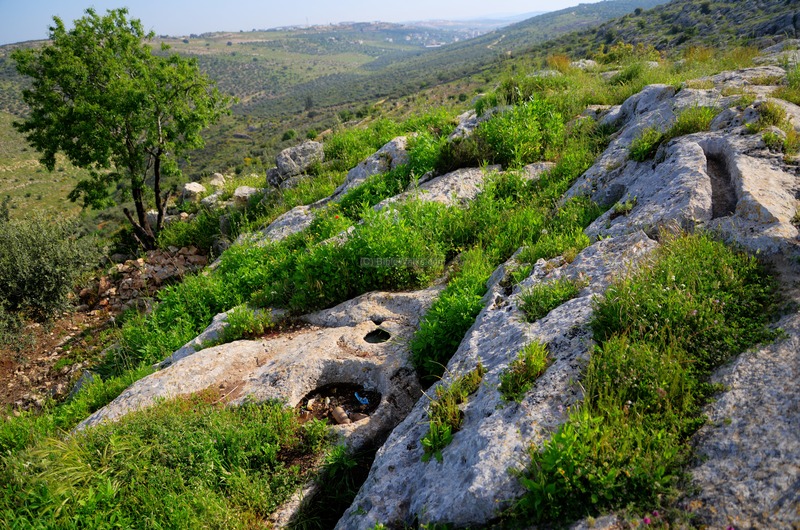 "Surdah - a small village on a hillside, with a garden to the south of it, and the spring 'Ain Jelazun on the east. 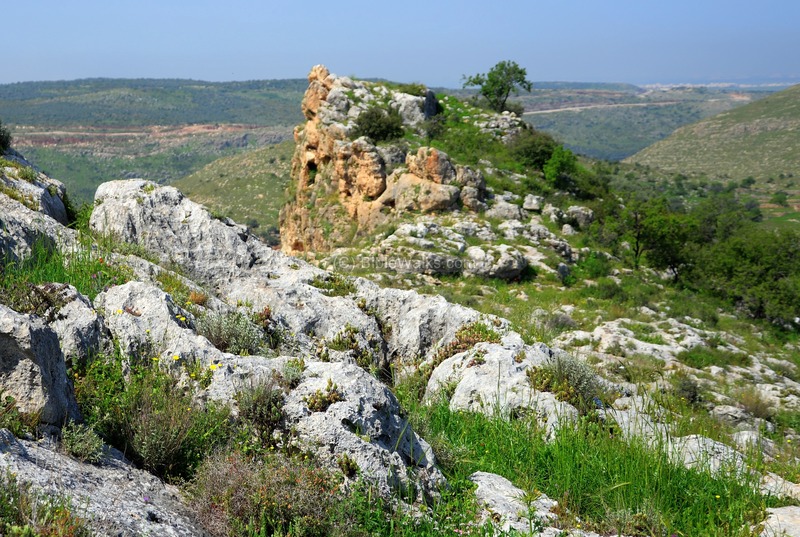 The name suggests its identity with Zereda, the native town of Jeroboam.". 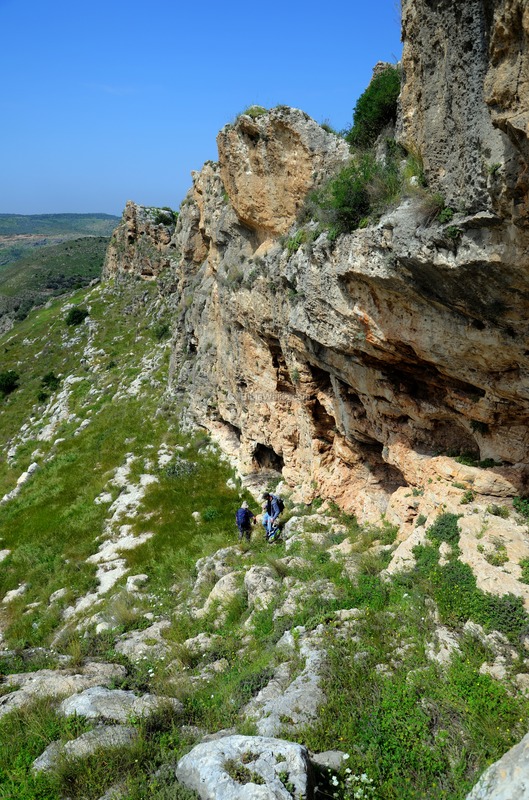 In the surveys conducted here (Eitam 1980: 8-15, Finkelstein et al 1997: 258-261), the major periods found on the site are the Iron Age II and the Persian period. 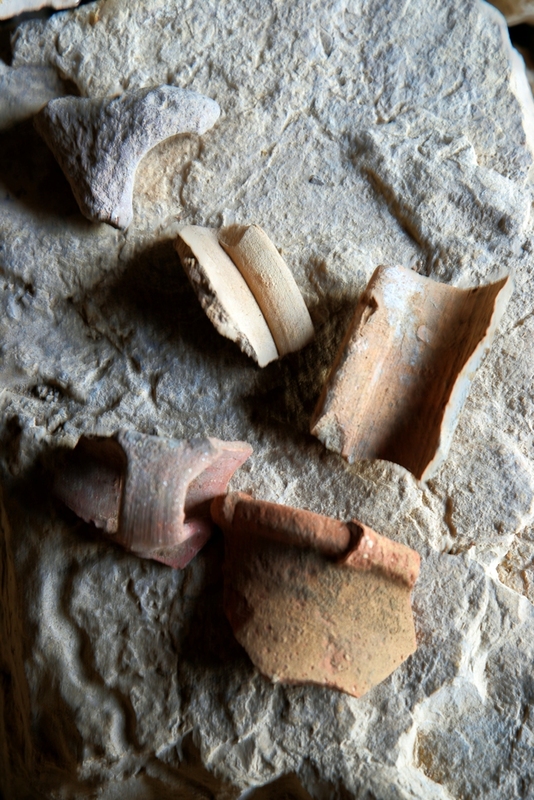 Other periods include Middle Bronze, Iron Age I, Hellenistic and Roman. 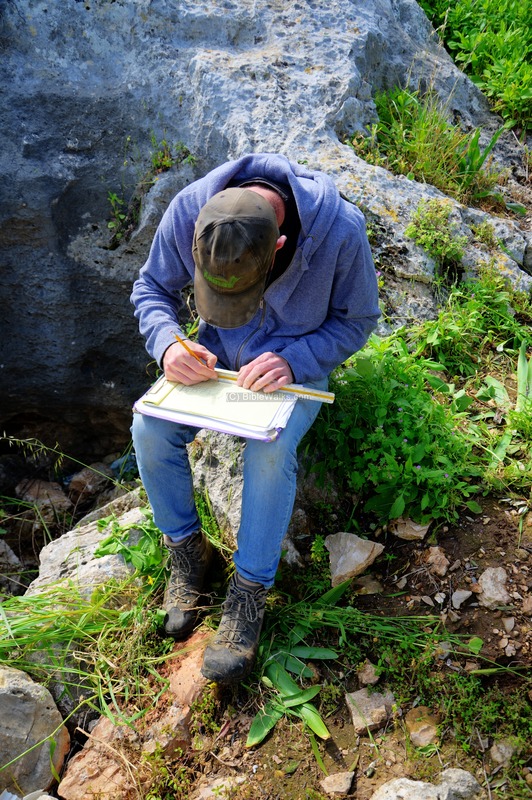 The surveyors noted remains of buildings, heaps of stones, Iron Age oil presses, installations and animal pens. 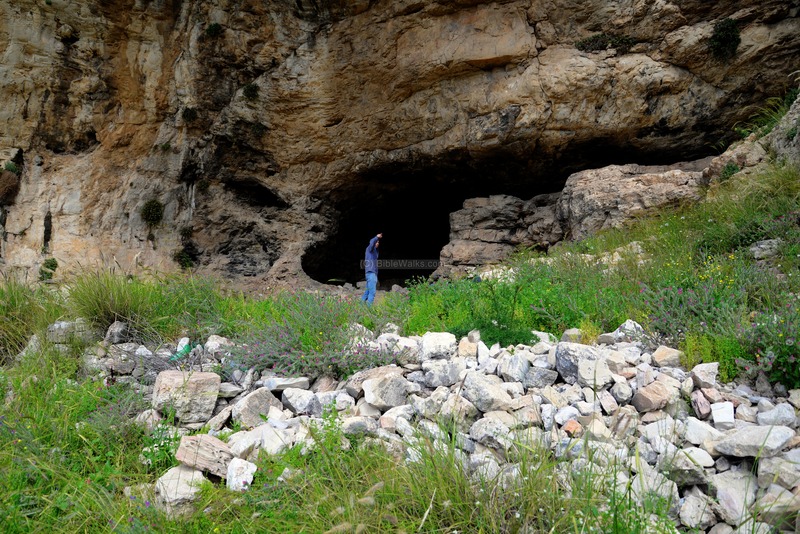 The site was identified by Kochavi as Zereda - the place of origin of Jeroboam. 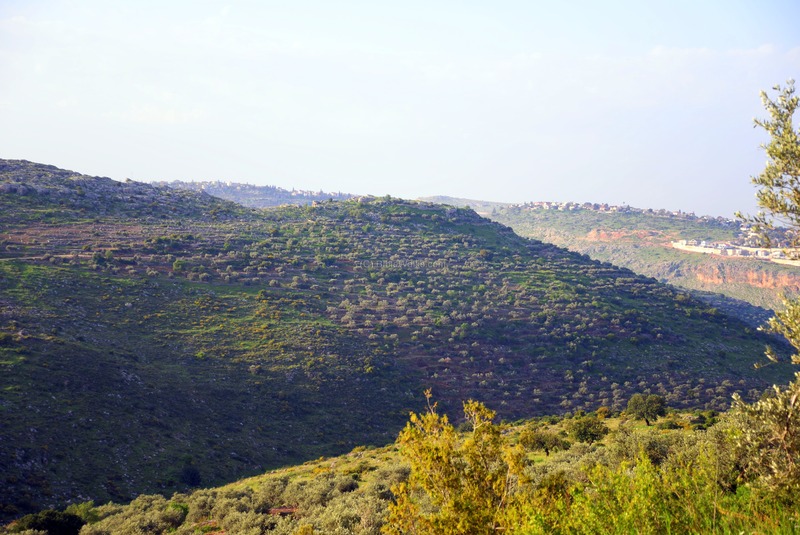 To reach to the site, either take a hike from the community of Peduel, or climb up from the Shiloh valley. Note that the hike needs to be coordinated with the army due to security reasons. A view of the north side of the ruins, as seen from Peduel. 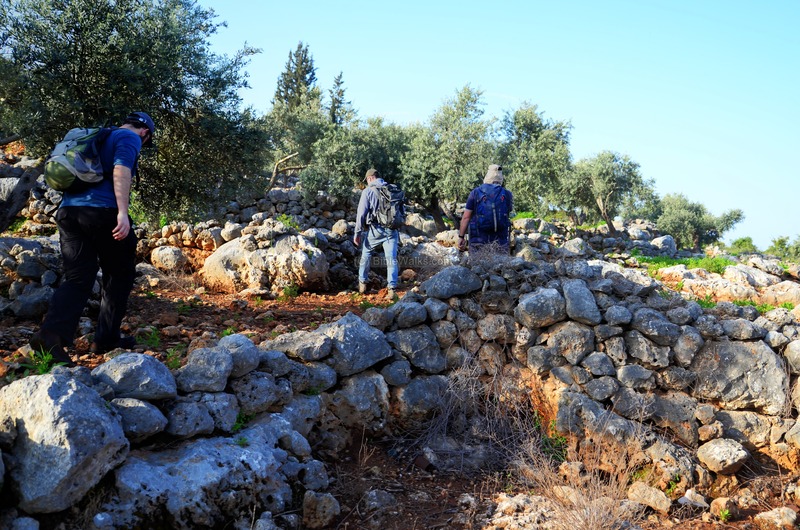 We reached the site by walking down the foothills of Peduel, and then up thru the olive tree orchids. 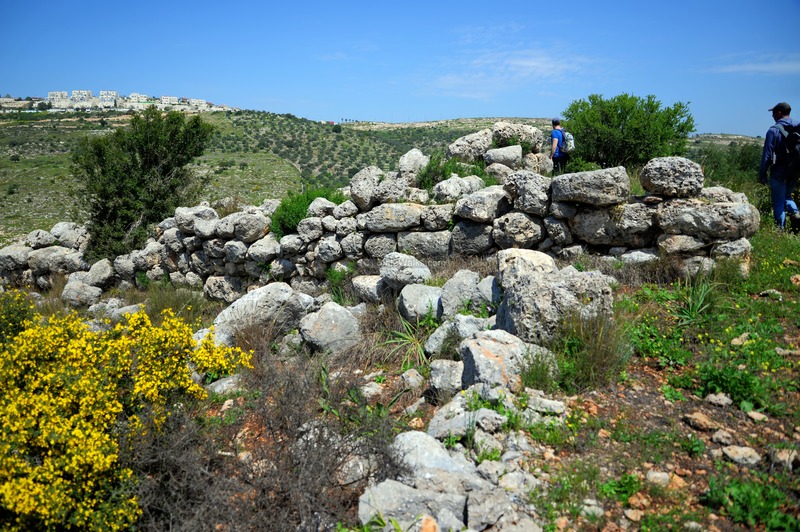 Near the site is a large cistern - an ancient water reservoir that supplied year-long water to the fortress. 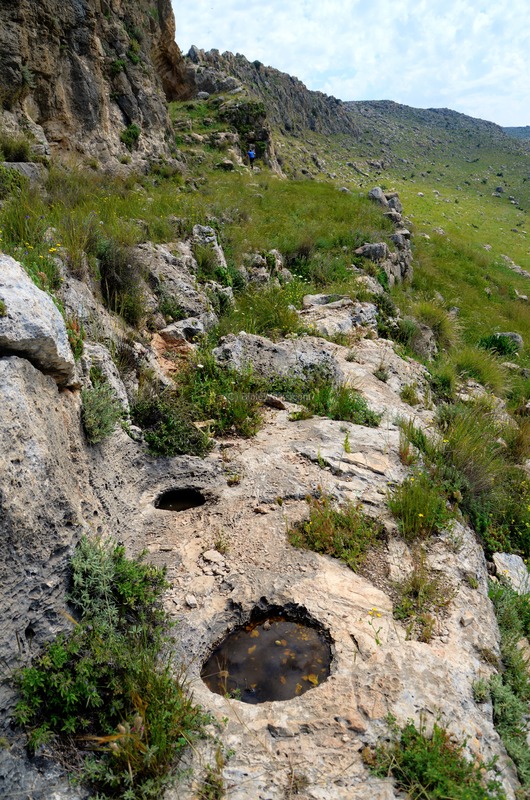 On the north western side of the peak are two cisterns and six rock-hewn agricultural installations. 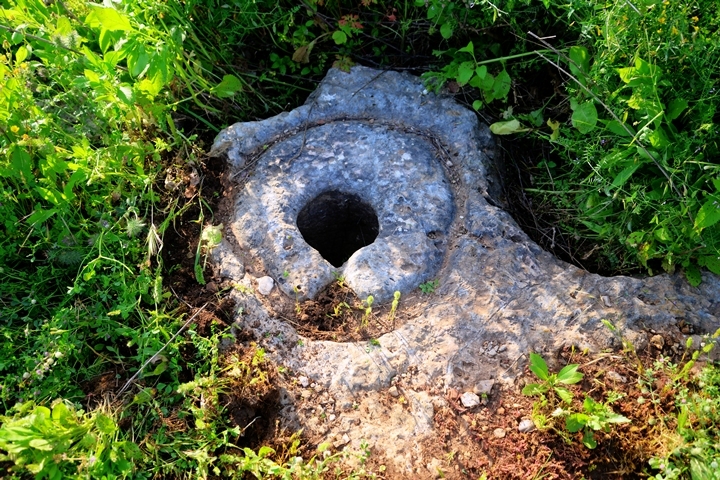 Along the path are agriculture installations, such as this Iron Age oil press. On the cliff are the ruins of Khirbet Banat Bar, identified by scholars as the Biblical Zereda. The remains of the Iron Age village are located on the North and western foothills of the peak, spread over a strip of 500m along the cliff. 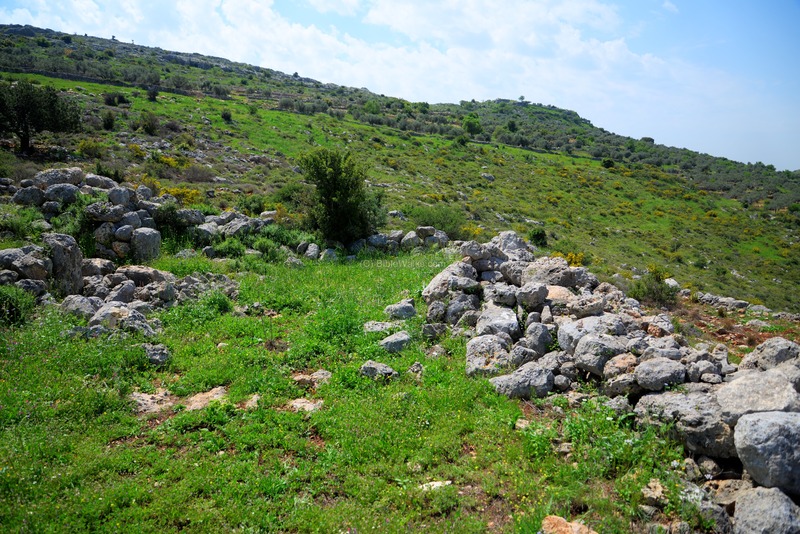 The surveyor (Kochavi) identified several dozens of houses in the Iron Age settlement. The buildings are mostly buried under heaps of stones. This view from the north east shows the peak of the cliff, and the northern and western foothills where the ruins of the village are buried. 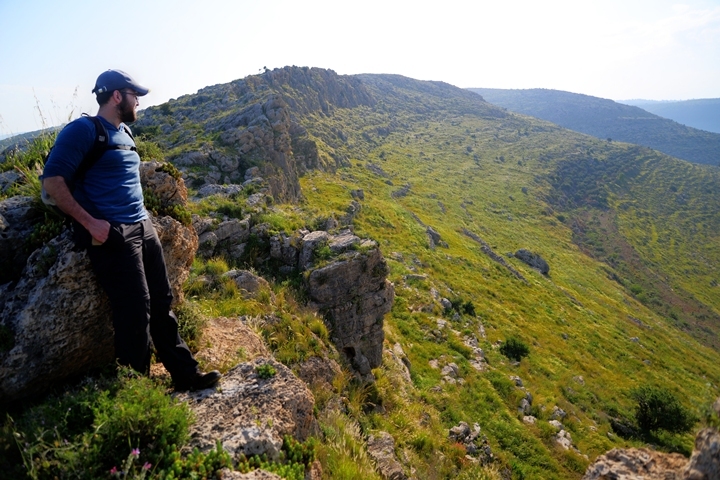 From the edge of the cliff are great views of the southern foothills. 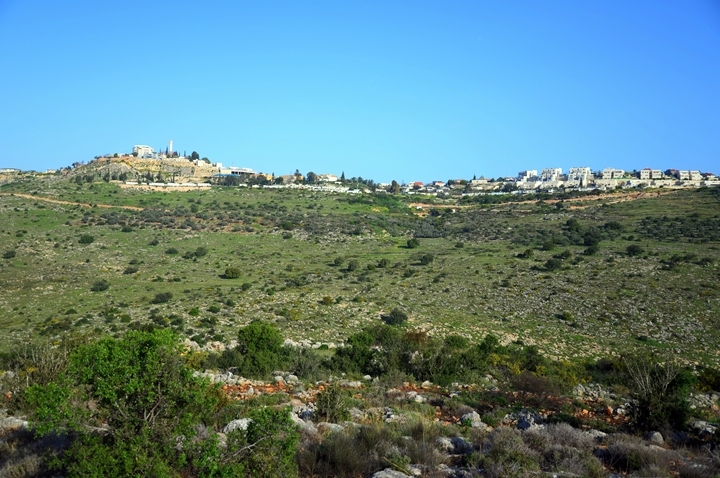 The cliff is arranged in a crescent shape around the loop of the Shiloh valley, which is 200m below the peak (at a height of 360m). 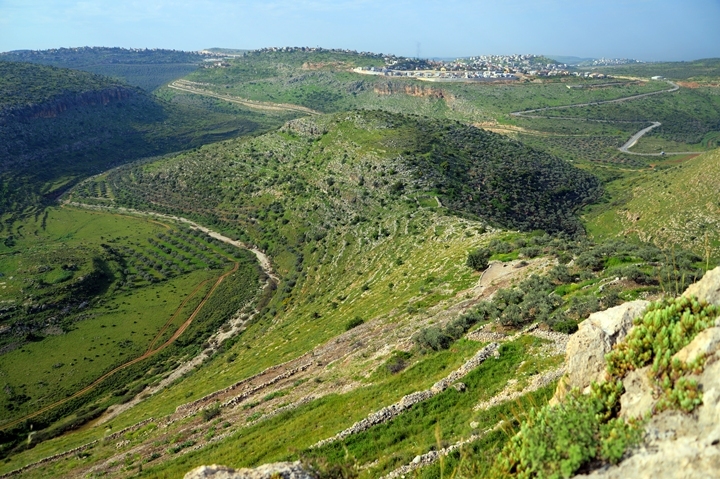 From the cliff is also a remarkable view of the loop of Nahal Shiloh stream. In the center of the horseshoe loop are ruins dated to the Hellenistic/Roman/Byzantine period. These ruins are named Khirbet Balata , meaning the "ruin of the flagstones". Another view to the west of the horseshoe loop is a ridge. On the western foothill are remains of the village houses. 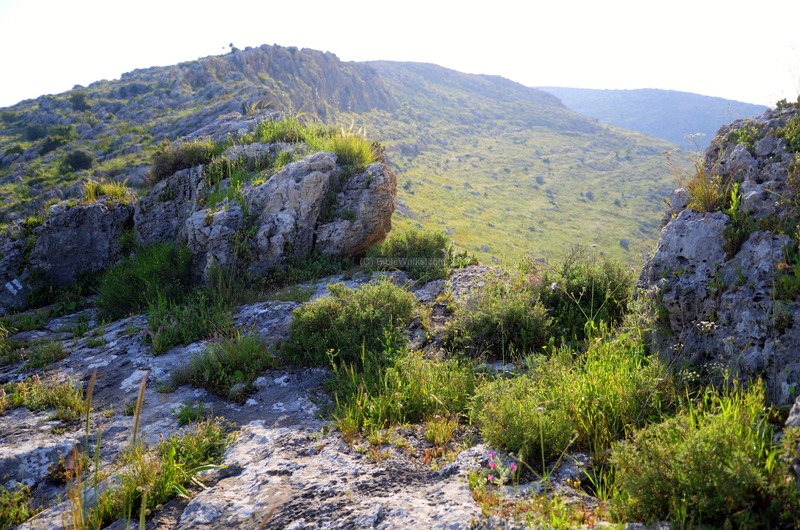 In the saddle of the ridge is an Iron Age fortress that protected the ancient route along Nahal Shiloh stream. 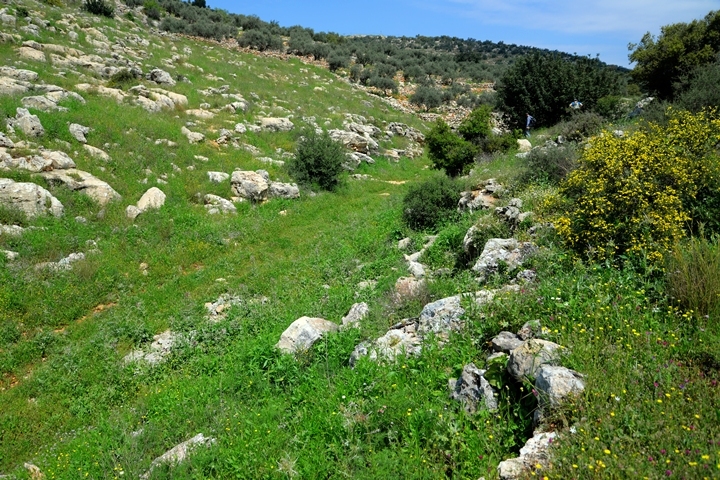 This route ('S8' according to Dorsey) was used to enter the hill country, following for 10km along the valley of Nahal Shiloh. 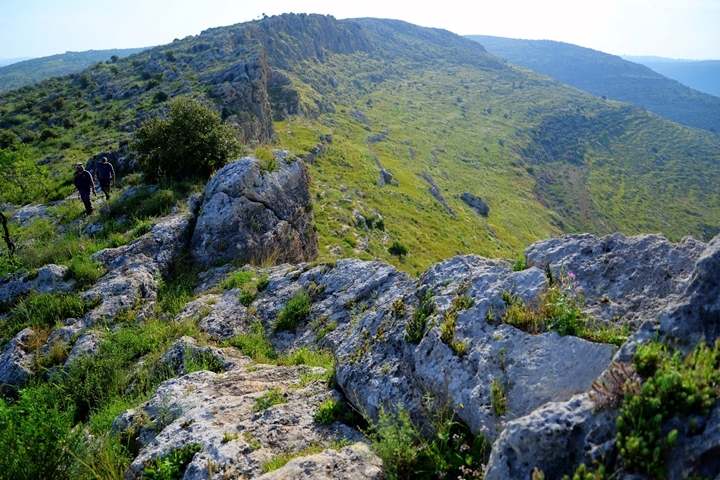 It connected Aphek (Antpatris) in the Shephela, to the hills of Samaria, via Thamnatha (Tibneh) to Gophna, and finally reached Jerusalem. Remains of the Iron Age fortress of Zereda - the possible home town of Rehoboam - are located on the peak of the ridge. Walking up to the peak, we observe an ancient staircase which was cut into the rock. On peak of the cliff are two pools, rock-hewn agriculture installations, and traces of structures and walls on the lower terrace. Dr. Dvir Raviv, the archaeologist who headed this survey, measures and draws the plan of the fortress. There are many natural caves on the south foot of the cliff. 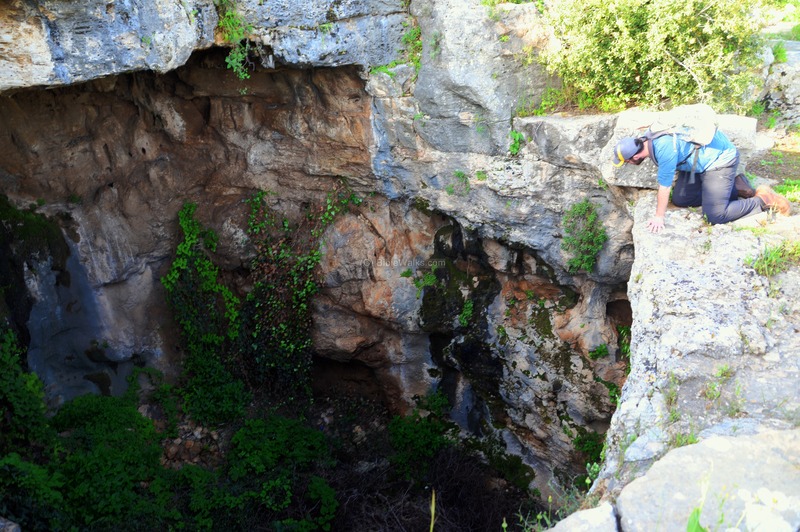 One of the caves, located 150m east of the peak of the cliff, cuts thru the width of the cliff from side to side. Entering it on the north side, then exiting on the south side. In front of the cave is a quarry, where the building blocks of the walls in the cliff fortress were cut. 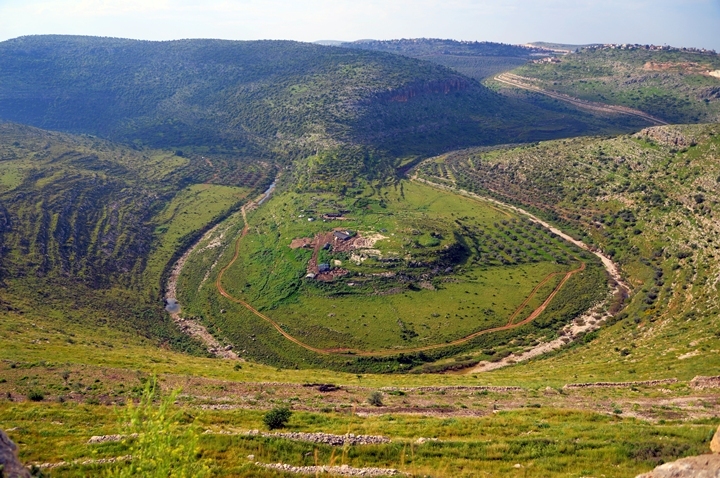 After exiting the cave on the south side, a great view of the Nahal Shiloh valley opens up, with the horseshoe loop and the ruins of Khirbet Balata in the center. Looking to the east - a view of the south side of the cliff. Along the edge of the cliff are many agriculture installations, mainly small iron age oil presses. This was the industrial area of the village. 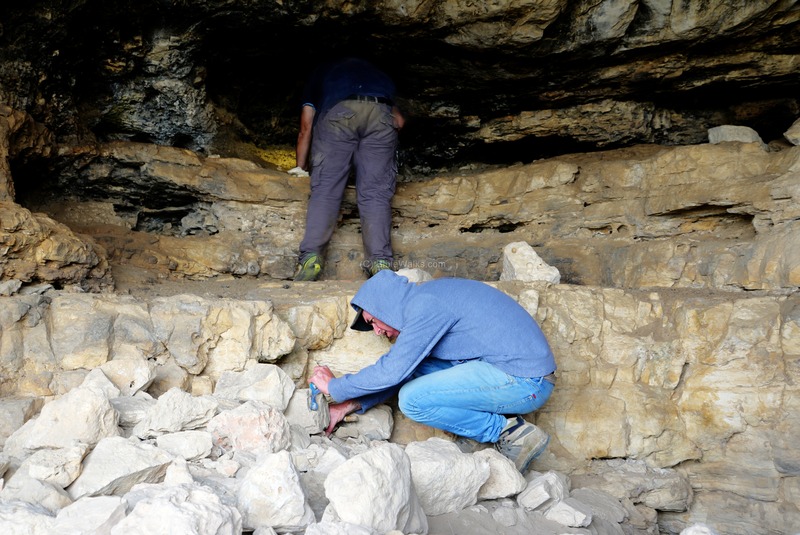 In a survey of the area, 17 rock-cut oil press installations were found here. 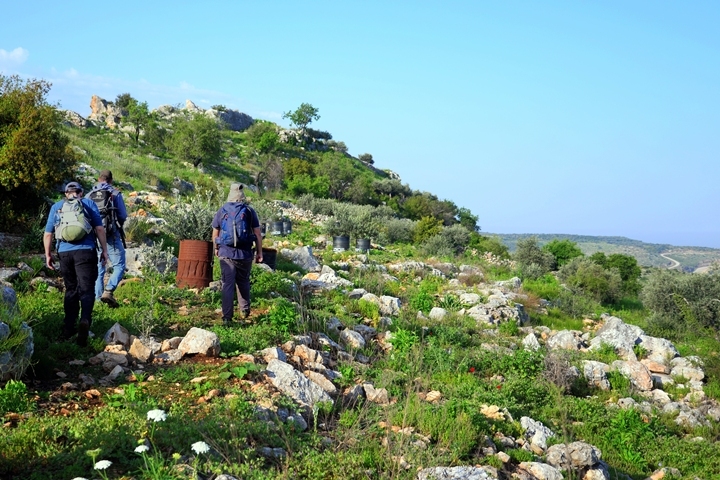 Olive oil was an important commodity for local use and for sale. Along the wall of the cliff are many natural caves. 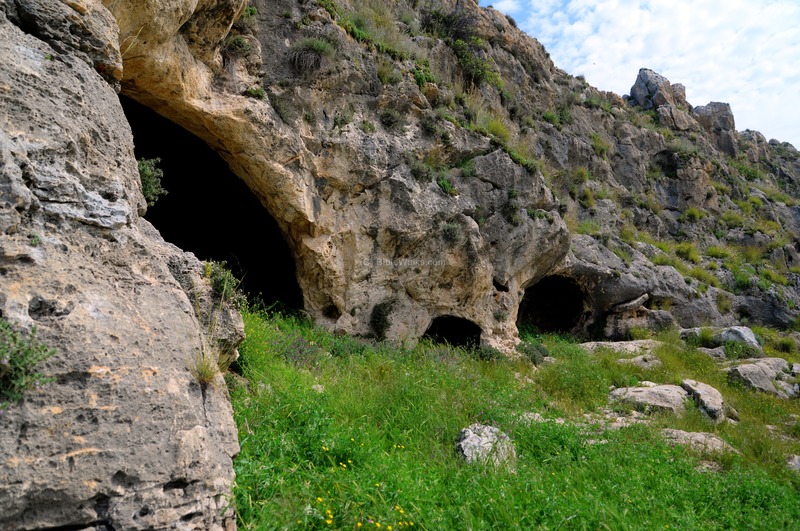 The caves were used for shelter, storage places, hiding places, and residential. 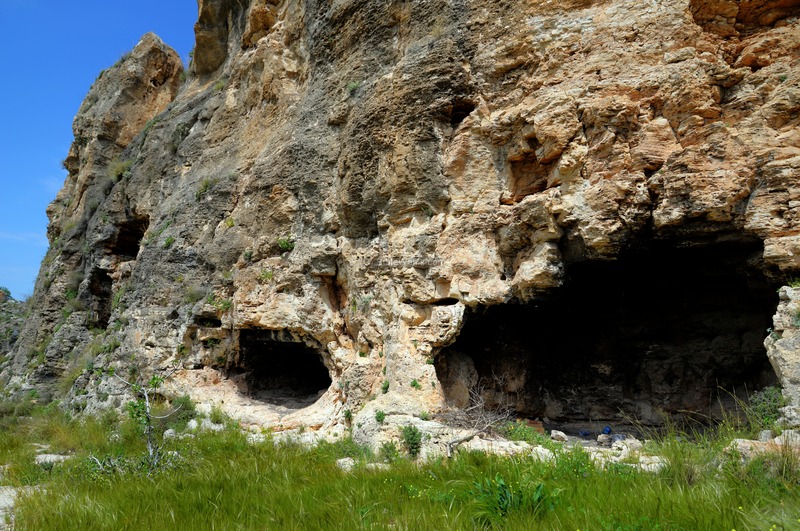 This is one of the largest cave, with traces of a wall near its entrance. 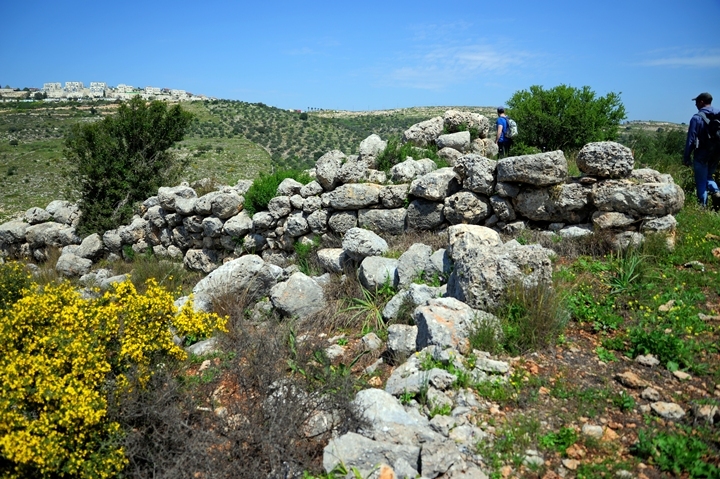 A small Iron Age fortress is located 300m north west of the high point of Zereda (Kh. Banat Bar). It is named by the Arabs - the Khandak (or Handek) - meaning a ditch around a fortress. Its ruins are seen here from the path that descends from the cliff, with a view of the valley and the community of Peduel in the far left background. 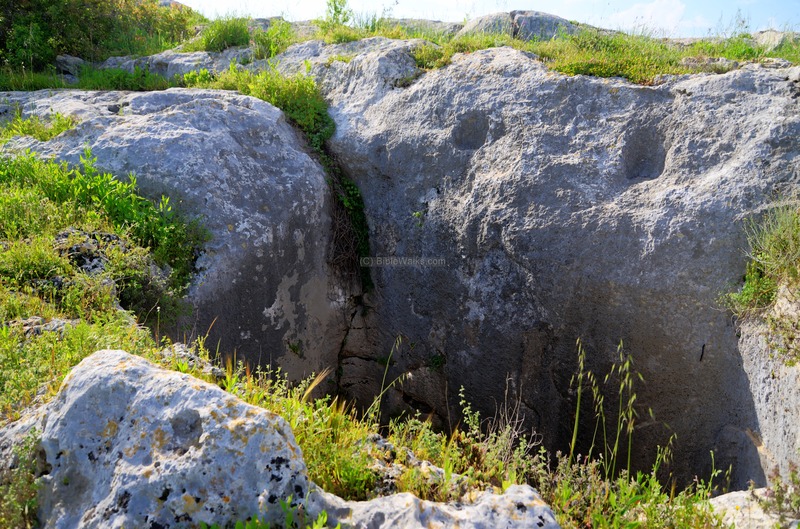 The square fortress, dated to the Israelite Kingdom, is built of large fieldstones. Its plan is based on a typical Iron Age structure - the four room Israelite house - three parallel spaces with a perpendicular space to them. Two megalithic columns are standing in one of the entrances. A well is located 100m north east of the fortress, which could have been its source of the water supply. 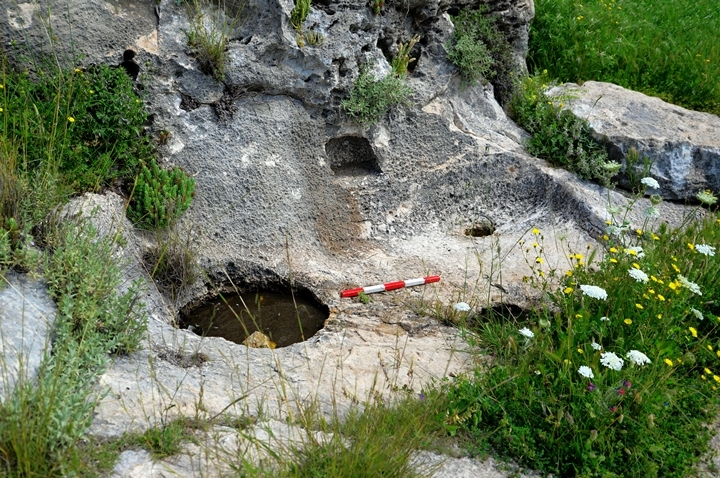 An alternative well may have been located inside the fortress. This fortress protected the road to the Biblical town. Its purpose was also to defend the weak side of Zereda - the northern slopes. 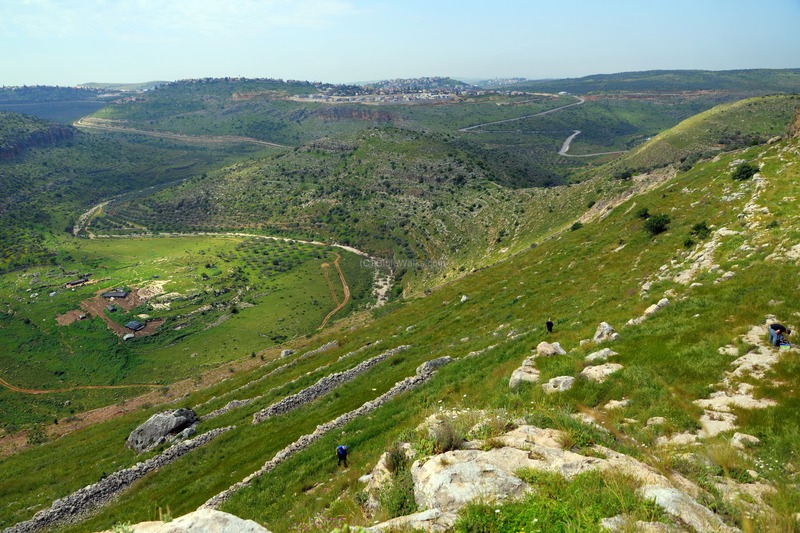 Just below the fortress is a valley, where the road descended from the valley of Nahal Shiloh. The fortress served as a gateway from this road to Zereda. 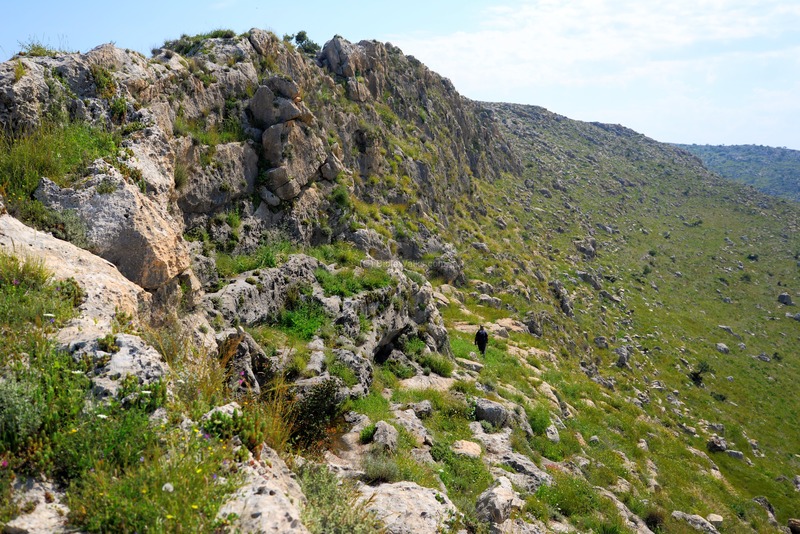 An ancient route passed in this valley, connecting the South West to Shechem in the North East. This route ('S9' according to Dorsey) connected Jaffa (Joppa) and Lod (Lydda) via Rentis, thru Zereda, to Shechem. 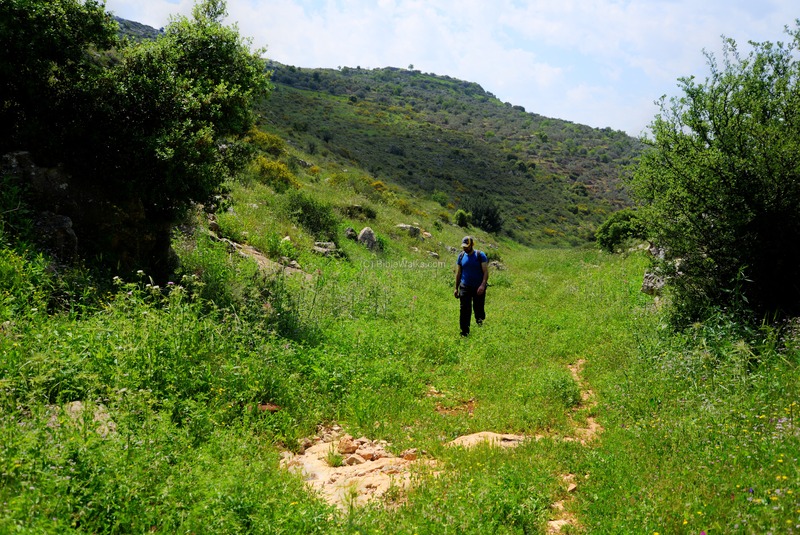 Shai is seen here walking along the dirt road, with the cliff of Zereda in the background. The hike to the site passes along the olive tree orchids and the open nature areas. We picked up some of the wild flowers that were observed during the Early Spring. 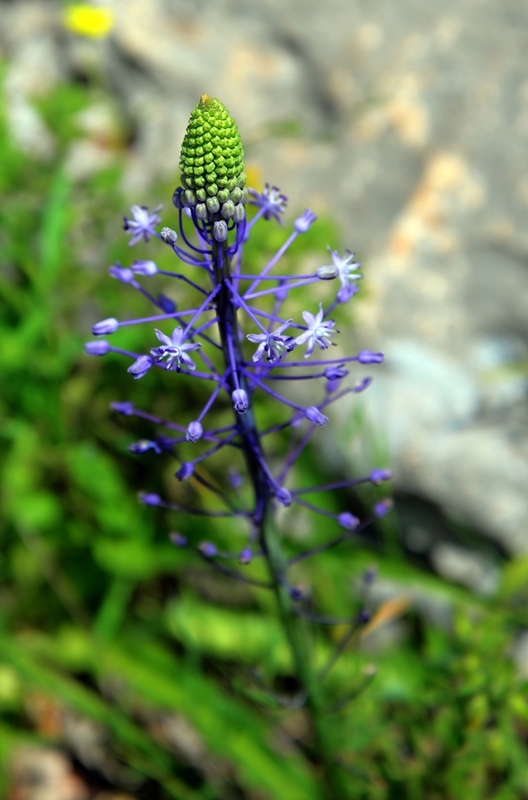 The first flower is Hyacinth Squill (Hebrew: Ben Hazav Yekintoni), which flowers in March-April. 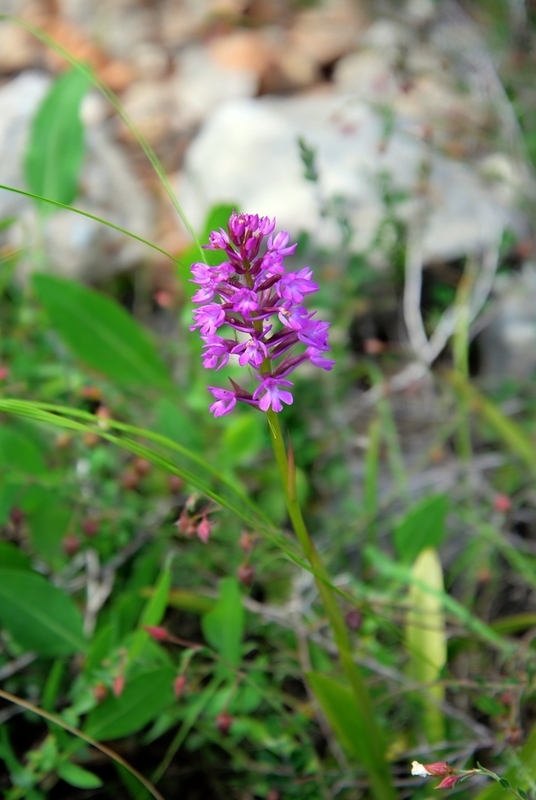 Another flower is the Pyramidal Orchid (Hebrew: Ben Sakhlav Zrifi). It flowers in April and May. Zereda (Zeredah, Zreida) - Biblical name; meaning unknown. Hebrew: middle finger (as per Concise Sapphire dictionary). Kh. Banat Bar - from Arabic: "ruin of the daughters of the son"
Kh. 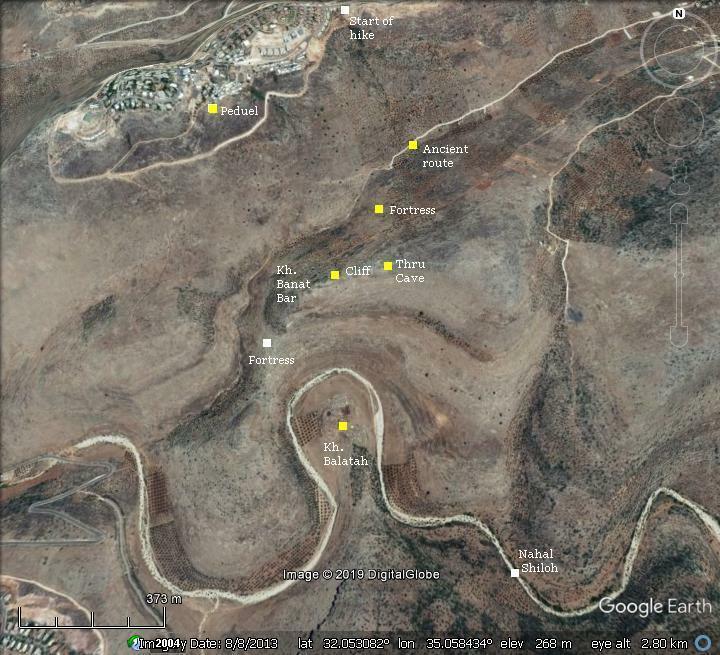 Benat Burry - name on the PEF map, Arabic: "daughters of the desert dweller" - a cave in the side of the precipice. Kh. Balatah - the ruin of the flagstones.